Let's take a look at the new "Gadget Selection Menu" shall we? Ahoy mateys! I promised to share some new material from behind the scenes, so why don’t we talk about the new gadget selection menu, shall we? The gadgets are still displayed in a circular fashion, but thanks to Michael the arrow is less sensitive now and doesn’t frantically reset to its initial position all the time. Especially players who use the mouse and keyboard will definitely appreciate this. 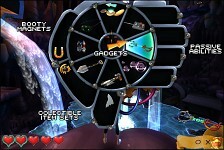 Next to the gadgets – passive abilities will be displayed (on the right side). For example the Ninja Shoe Soles which allow you to surf on cables and railings or the descend function of the Jetpack. The Booty Magnet is also a passive ability (if you’re snickering now you have a dirty DIRTY mind), since it conveniently pulls coins and gems towards you as you pass by. There are different versions, each with a different radius, so they have their own spot in the menu right now. We might turn them into an upgradable icon and also list it among the passive abilities in the near future. We will hide collectible items in the levels that you will need to find in order to gain access to special areas. :) Once collected these will also be displayed. We hope you like what you see! Any comments from your side? On the topic of the preview build: while we’re still waiting for Unity to wrap up development on their new release, we’re also testing the game with the help of Jack Marshall of “Tofu Testing“. He is helping us catch those last remaining bugs and he’s a great help. If you’re an indie developer and need professional help on testing your game, he’s someone you should definitely talk to.